Don’t judge a book by its cover because you will be deceived. The same goes for what seemingly looks like the dusty little town of Diglipur. Let me tell you a fact- Diglipur is the largest Island town in the Andamans and is also one of the lesser known tourist destinations. 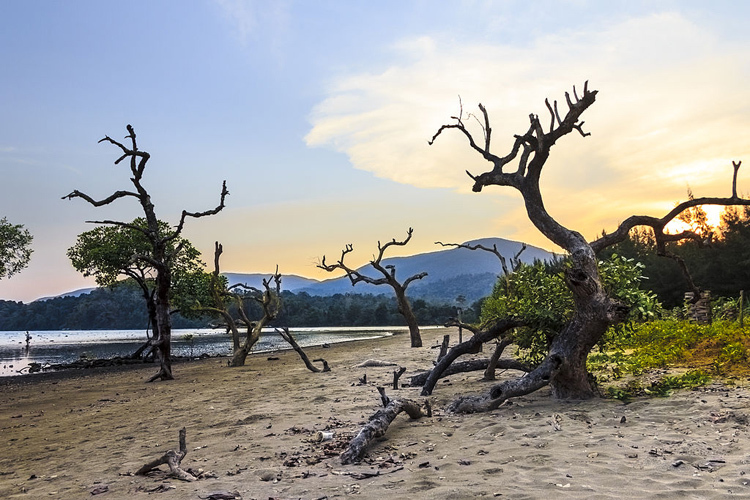 This little tropical haven has so many specialities and it harbours some of the rarest attractions that you can’t find anywhere else in the Andamans. Famous for: Flora, Fauna, Beaches. Opening Timings: Open daily but visit recommended during daytime. You cannot complete a visit to Diglipur if you haven’t been to the village of Ram Nagar. With lush mangroves and thick forest vines, surrounding the place, it is a vision to behold. This beach is perhaps one of the less crowded beaches in the Andamans. The Ram Nagar Beach is ideal for some water-fun but it is not for beginners. The waters of Ram Nagar Beach are infamous for its sharp coral reefs and people need to careful. Just avoid that part of the waters and the rest is fine. You need to make sure that you have a local guide with you so that you know where exactly you can venture out and where you cannot. Visit the Ram Nagar Beach. Famous for: Flora, Fauna, Pebble Beach. The rugged beauty of the deep blues is present in the Lamiya Beach. This is perhaps the most visited tourist site in the whole of the Andamans and you are in for a surprise if you expected a regular beach. There is something untamed and beauty that runs wild in the Lamiya Bay Beach. Another attraction here is that the beach is the Saddle Peak, the highest peak point in the entire Islands at a height of 800 metres above sea level. This is the best trekking destination and definitely the most challenging one in the entire island groups. Take a trip to Saddle Natural Park. Famous for: Caves, Trekking, Adventure. Duration: 2 days to visit the whole set. Typically 1 day spent. Caves harbouring treasures and mystifying creatures in its dark interior has always topped my imagination. If this is true with you too, then I am sure that you would simply love the Alfred Caves. This exploration itself take at least 2 days to complete because the Alfred Caves is not a single cave, but a set of 42 caves spread across Diglipur. This is definitely not for those with a weak heart because this trek is perhaps the most difficult and challenging expedition in the entire Islands. The trekking trails to the Alfred Caves are quite narrow and at times dangerous even. So, make sure you have an experienced guide with you to ensure that you won’t get lost in these winding paths. Famous for: Isolation, Flora, Corals. Opening Timings: Open 24 hours but visit recommended during daytime. The fuss is not entirely about the Beach, though it is an unparalleled beauty with wide open sea, rich with coral reefs and housing some of the rarest varieties of marine life. Since it is not easily accessible by road, by foot or by waterways, it poses an issue for tourists because it is definitely an isolated location. But Pathi Level Beach is a haven for those who crave a little bit of privacy away from prying eyes and crowded beaches. Famous for: Trekking, Mud Volcanoes. Get down at Shyamnagar in the Diglipur County of the Andamans ask the locals for ‘Jal Tikry’. Now this is quite a rare sight because the village of Shyam Nagar harbours a unique scientific phenomenon- mud volcano! Trek through the dense forests of Shyam Nagar and after an hour’s walk you will reach a series of mud volcanoes, some which are active for years and some which have lain dormant for quite some time. This is one of the rarest occurrences in the entire world. These active mud volcanoes make you wonder about the playful secrets of Mother Nature. Tickets: No entry fee but restricted access only. Duration: 2-2.5 hours (mainly depends on the visitor). Not to be confused by Ross Island near Port Blair, Ross and Smith Islands hold their own among the many beaches around Andaman. Walk from one island to the other on a narrow sandy white trail, amidst surrounding lush green glens and turquoise waters. Also, the sand bar joining this island with the adjoining Smith Island is an added attraction. Therefore, this is a dream come true for any tourist and while standing amidst such scenic abundance, one does not want to leave its crib. What more does a tourist want? The Ross and Smith Islands is indeed beauty at its epitome and a dream destination for all those who plan a trip to the Andamans. Things to Do at Ross and Smith Islands. Famous for: Beach, Olive Ridley Turtles. You might have seen those tiny little heads popping out of their shells and crawling to the sea. Their cute little trails on the ocean creating wonderful patterns. Yes, I am talking about turtle-watching! The Kalipur Beach is famous for its turtle trails and it is a wonderful sight to see these little creatures making their way out into the open. The virgin white sandy beaches and lush green dales and pristine waters and open sea, further add to the beauty of the place. See the nesting ground for Olive Ridley Turtles (seasonal). Famous for: Wildlife, Vegetation, Trekking. Tickets: Entry permission required from Forest Department. Opening Timings: Open till sunset. Duration: 5-6 hours to trek. Saddle up to mount the highest peak in the Andamans, because you are up for the sight of your life. The Saddle Peak National Park in Diglipur is a wonderful tourist destination and an eco-friendly paradise. A haven for those who have been tormented enough by the touch of modernity, Saddle Peak is a dream come true for all adventure enthusiasts and wildlife lovers. Trek (easy) on natural trails. Enjoy viewpoints from Saddle peak. A visit to Diglipur involves a lot of walking so make sure you pack a good pair of trekking shoes. This might cause a problem to those who wish to lay back for their vacation. But what fun is it, when you have such scenic abundance all over and you fail to explore it? Diglipur shouldn’t be judged because of its looks, and the beauty of the Island runs wild in all its magnanimity. A siren call for all those who crave a bit of change and adventure in their life, the Andamans offers something for everyone.